The PWR9-12 is the ultimate in CCTV power supplies. This high output 12 VDC power supply box provides 1 amp per output, with 9 outputs for cameras or accessories. The power in this box is regulated to ensure a smooth, consistent 12 Volt DC output, this smoother voltage in to your cameras or accessories will help to ensure longer life for your expensive cameras. 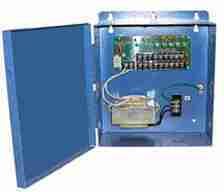 This box also protects from spikes and shorts, without needing to replace fuses, as it has a PTC protected circuit, that operates like a self-resetting circuit breaker, disconnecting the circuit if there is a short or surge, and reconnecting it once normal circuit is restored. This advanced power box is suitable for high output infrared cameras and HD IP cameras alike, as it provides up to 1 amp per output and has 9 total camera outputs.